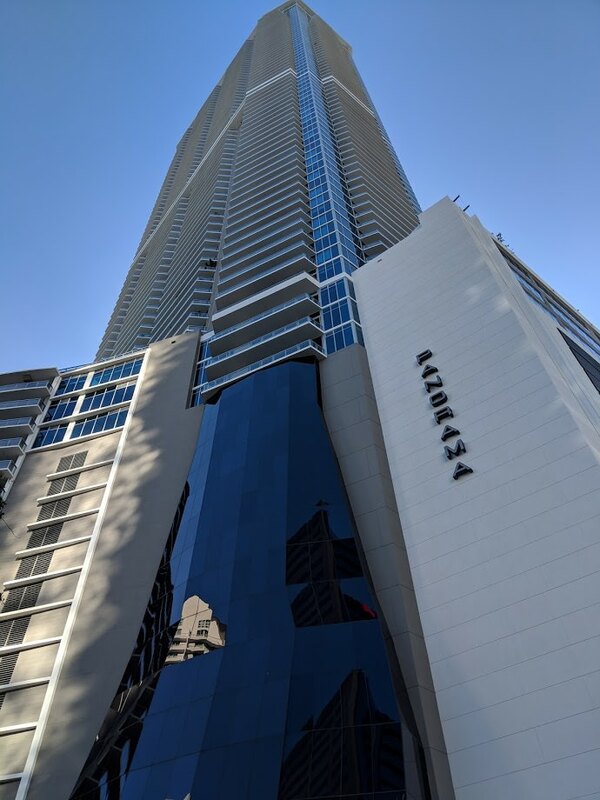 Demand for apartments at Brickell’s 85-story Panorama Tower has been very strong since the building opened six months ago. More than half of the building’s 821 units are now leased, developer Florida East Coast Realty and leasing agent Fortune Development Sales announced yesterday. Panorama welcomed its first residential tenants in June. Amenities include private wine and dining rooms, three private movie theaters and a bayview yoga/pilates studio. Also being introduced as a new amenity to residents is the Panorama Tower Beach Shuttle, which will transport residents to Key Biscayne’s Crandon Park Beach. It will operate twice daily on Saturdays and Sundays. Departures from Panorama Tower are at 9 a.m. and noon, while departures from Crandon Park Beach parking lot #1 are at 12:30 p.m. and 4 p.m.
Panorama is the tallest building in Florida at 868 feet above ground. Other components to the tower include a 208-room Hyatt Centric hotel, 100,000 square feet of office space, and 50,000 square feet of retail. Nice picture. Does well to hide the fact that this is an ugly building. At least it’s better than Four Seasons, and hopefully something else, maybe a certain tower by the same developer, will surpass it as Miami’s tallest soon. Um the Four Seasons is beautiful, and actually iconic. Four Seasons has 20ft Botero scultures and amazing water features, Panorama has 3ft Britos and LED Light features bought from eBay. It does not look like the rendering presented by the construction company….such a huge miss there…. Good news for the demand of rental apartments in Miami. But sorry this building is crap and overpriced, saw it and will never move in there as planned before. So says the Anonymous economist..
Nobody moves to Miami anymore, it’s too crowded. Please.. you wanna see crowded?.. check out Tokyo or Mexico city. Okay…so you don’t get the humor or economics. If there were a modicum of truth to that, the demand would go down, and the prices wouldn’t keep going up. IF Miami was so “way overpriced” then the population (especially Brickell) would not keep growing at such a rapid rate. Your conclusion should be that, Miami is NOT overpriced to the people that keep moving here. Yogi Berra said this about a restaurant, “Nobody goes there anymore, it’s too crowded”. Get it?!?! Research shows more that 60% can’t afford to live in Miami ….Miami is thriving through tourism and perceptions. More are moving to the city but it’s not because it’s affordable it’s cause they are rich and fleeing the cold congested north. Okay, I’ll try to be really brief. See the difference? No quotation marks to tie in what he’s talking about and why he’s making a mockery of what another anonymous said. Get it!!! Maybe, but could also just be switching. No comment in this article about overall vacancy levels. Either their rent is high or their screening process is intense. Rent is high. I have a friend who works there, but she says the amenities sell it. But will they keep up the amenities. Or they achieved their Certificate of Occupancy in select floors, and they are unable to lease up those floors even if they wanted to. No developer moves in 800 apts in month or probably even a year. With respect to the Panorama Tower Beach Shuttle, Crandon Park is on Key Biscayne, not Virginia Key. Only 1% of people in Miami can afford their prices. #2. The population of Miami is 463,347. If “only 1%” can afford it, the 4,633 people are more than enough to rent the 800+ apartments. I live in the building and there’s no more than 30% rented at the best! On my floor they are 3 rented out of 11, and I have two friends living om different floors: one has 2 unit rented and the other 3 also! Most of the 3B are empty. The 2B are very popular. 1B prices are ranging from $1,900 to almost $3,000 depending on the floor. 2B from $2,900 to $4,200 and 3B starting at $5,500 to over $7,000. The pool is by far the most ugly I’ve ever seen! I’m moving out in a few months they are a lot of issues in the building especially with the parking where we have a massive amount of people outside of the building using the valet and all the students from the school next door. Soon the parking will be full and it won’t be possible to park since wherever there’s a free spot!